The Ocean County Sheriff's Office shared this photo of smoke from the Spring Hill fire, a wildfire burning in the Pinelands, on its Facebook page on Sunday. Forest firefighting crews have contained a blaze that burned more than 11,000 acres of the South Jersey Pinelands, officials said Monday. The cause of the fire in Penn State Forest in Burlington County is under investigation. The Spring Hill fire, as it was being called, was first reported around 1:45 p.m. Saturday, said Lawrence Hajna, spokesperson for the New Jersey Department of Environmental Protection. Crews succeeded in containing the fire overnight, the DEP’s Press Office said Monday morning. Hajna said the blaze, which was in parts of Woodland and Washington Townships, had forced the closure of Route 72 between Routes 539 and 532. Officials had not ordered any evacuations, Hajna said, and no injuries were reported. 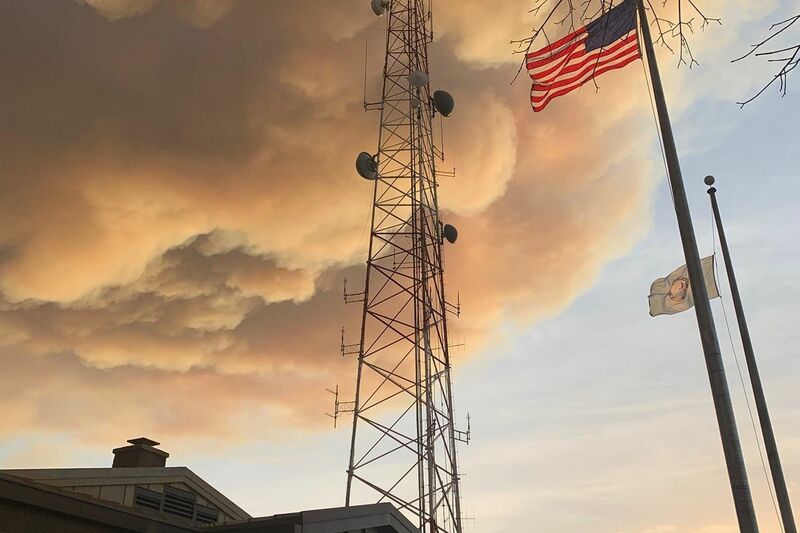 The National Weather Service in Mount Holly said Sunday on Twitter that smoke from the fire had spread through central and northern New Jersey due to a “nocturnal inversion,” which made it harder for smoke to disperse. Hajna said that forest fires in the Pinelands were “relatively common,” but that this blaze was the largest in at least several years.